A man pleaded guilty to dangerous driving causing death and bodily harm, after a car crash devastated a high school. Janet Dirks reports. GRANDE PRAIRIE, Alta. 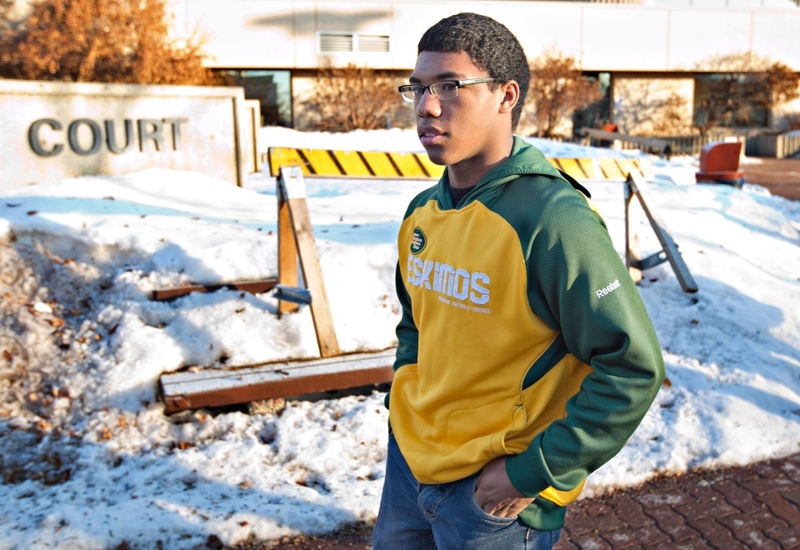 -- The lone survivor of a crash that killed four high school football players in northern Alberta says he thought about suicide after the collision. Zach Judd has told a court that when he heard that four of his teammates had died, he wished he had died too. "I feel I should be dead instead of my friends," Judd said in a victim impact statement Tuesday. 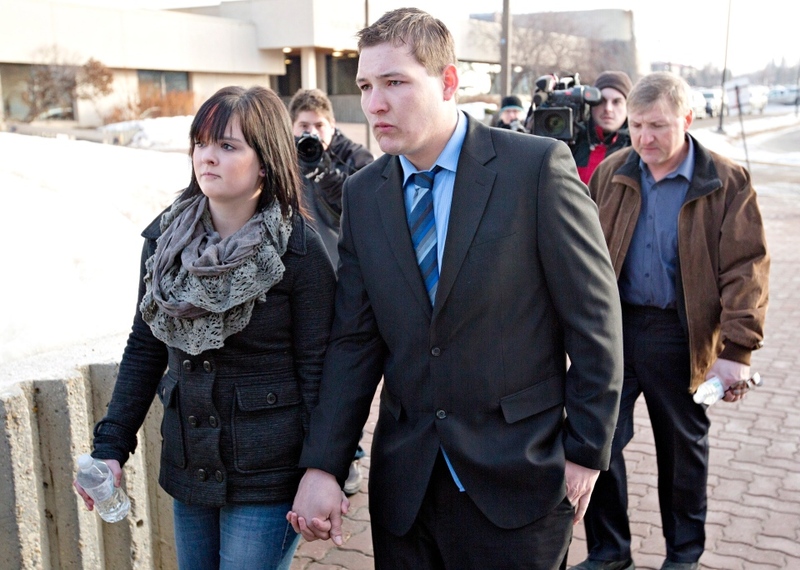 The teen was speaking at the sentencing hearing for Brenden Holubowich. The 23-year-old has pleaded guilty to dangerous driving causing death and dangerous driving causing bodily harm. The Crown and defence have agreed to a prison sentence of three years and a driving prohibition for another three years. The judge is to rule on that Wednesday. 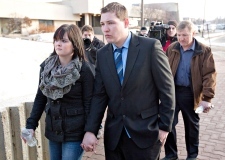 Holubowich's pickup truck collided with a car carrying five members of the Warriors football team from Grande Prairie Composite High School on October 22, 2011. Court heard Holubowich had earlier been drinking with co-workers at a Grande Prairie bowling alley and was driving at speeds as high as 151 km/h on Highway 668 on the way home to Wembley, Alta. The football players had been at a party outside the city and were making a U-turn when the truck struck the car's rear driver's side. Walter Borden-Wilkins and Tanner Hildebrand, both 15, and Matthew Deller and Vince Stover, both 16, were killed. Autopsy results on Deller, the driver, showed he had no alcohol or drugs in his system. Judd spent several weeks in a coma suffering from brain injuries, but slowly recovered. He said he lost hearing in one ear and that affected his balance. He hasn't been able to get his driver's licence back and will never play football again. About 80 people turned out to witness the plea, so many that court staff had to move the proceedings to a larger room. Many were wearing orange Warriors sweatshirts with the boys' football numbers on them. Their families were among the spectators. Some of Holubowich's relatives were also in court, often in tears. It appeared Holubowich -- a tall, strapping, heavy-duty mechanic apprentice -- was trying not to cry as well when he uttered his guilty pleas in a hushed voice. Defence lawyer Chris Millsap described his client as a humble young man, full of regret, who will never forget what he did. 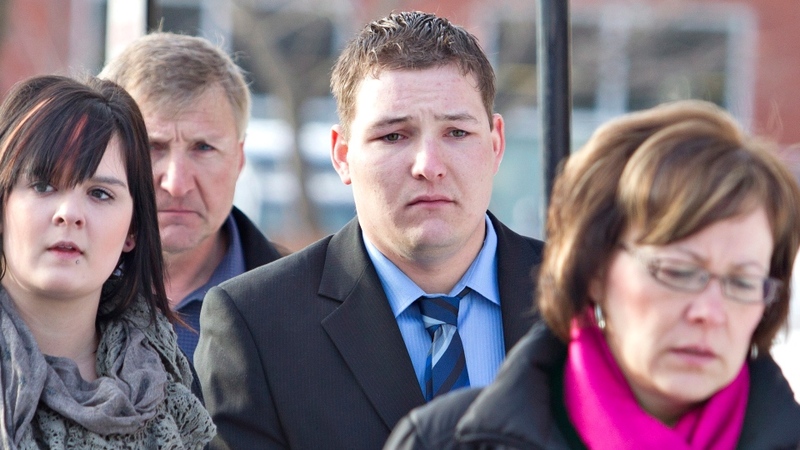 "This is a kind, very young man, who for a split second -- made a horrible decision." He also said Holubowich takes full responsibility for causing the crash, despite rumours after the accident that he blamed the teen who was driving the car, Matthew, for making the U-turn. The initial shock of the crash turned the entire community upside down and had football players across the country mourning four boys they never knew. People packed an arena for a memorial service. Many high school teams across Canada honoured the players with moments of silence at their games. The Edmonton Eskimos and Calgary Stampeders of the CFL put the Warriors logo on their helmets for the last couple of games of the regular season. The Warriors toughed it out and finished their season. They went on to win their league championship before losing in the quarter-finals at provincials. Their final run made national sports headlines. Coach Rick Gilson, the same man who helped RCMP deliver news of the crash to the boys' families, was later named NFL Canada's youth coach of the year for being a rock and role model after the crash. A new wing at the school, called a health and wellness centre, has opened since the accident. The $600,000 addition houses a full-time social worker, three guidance counsellors, career counsellors, RCMP liaison officers and a health nurse. But there are no memorials or tributes dedicated to the dead boys at the school. Grief experts told school officials it was best for students not to be reminded of the deaths and to try to move on.